Last year here in Dallas we all knew it would come before long, the Juan Toja wig night. It came with plenty of press and hype and in a way it didn’t disappoint all that much. Flip forward a year later and we expected another wig night with Toja still on board this season but a transfer to Romania put a stop to that possibility of improving on last year’s promotion. 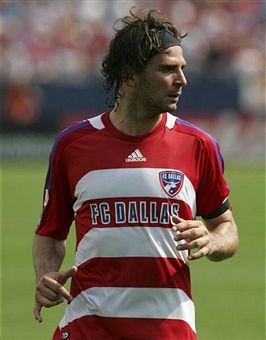 So what does FC Dallas do with all of those wigs that they ordered in honor of Toja? Change the player on the promotion, that’s what. First 5,000 fans through the gates receive a Duilio Davino Wig courtesy of Telefutura. Davino? Are you kidding me? Sure Davino has some nice hair (?) but certainly not the flowing mane that Toja had. Plus Davino wears a head band on his head. You should never have a wig promo centered around a dude that wears a head band. At least put a head band with the wig to make it legitimate. Its a lame attempt to recreate a good promotion from a year ago. Why not a SuperCooper night (which I think they are doing?). Or a Jeff Cunningham night were the first 100 get a free jersey style t-shirt with Cunningham’s famed 101 number on the back? Nice try Dallas, I think its a lame attempt to salvage some money that you spent on someone else.